The new Canon PowerShot G7 X is an excellent pocket camera for enthusiast photographers, offering a wealth of options for shooting both still and video, excellent image quality, speedy auto-focusing, intuitive and configurable handling, and solid construction. It can't quite match the bigger and heavier G1 X Mk II in terms of performance at higher ISO speeds, but it does offer most of that camera's functionality in a smaller package, and even out-performs it in some areas. In terms of the direct competition, the Canon PowerShot G7 X has definitely made a big leap forwards. Compared to the very popular Sony Cyber-shot RX100 Mk III, it's a very close-run thing, with the lack of a viewfinder (or any way of fitting an external one) on the G7 X being the biggest single reason to choose the Sony model for the keen photographer. If you don't need this feature, then the touchscreen capabilities of the G7 X are very compelling, as is the longer lens range, although the Sony RX100 Mk III's screen can be tilted both up and down. For us, the built-in EVF gives the Sony model the edge, but your mileage may vary according to which features you most value. Both are equally worthy of consideration. The G7 X's image quality is excellent for a compact camera thanks to the 1-inch sensor that lies at its heart. If you've ever wanted DSLR-like pictures from a fixed-lens camera, then look no further than the G7 X, with its fast f/1.8-2.8 lens creating very nice bokeh at both ends of the versatile zoom range when shooting wide-open. Sure, it still can't match a DSLR or an APS-C equipped compact system camera at the higher ISO speeds, but ISO 100-1600 is eminently usable with 3200 as a backup, not something that you can say about many compacts. In terms of build quality and handling, the Canon PowerShot G7 X gets most things right, offering a reassuringly rugged metal chassis and a plethora of customisable controls, including the lens control ring and exposure compensation dial, while the tilting touchscreen LCD, folding pop-up flash and 31-point AF system are all great features. 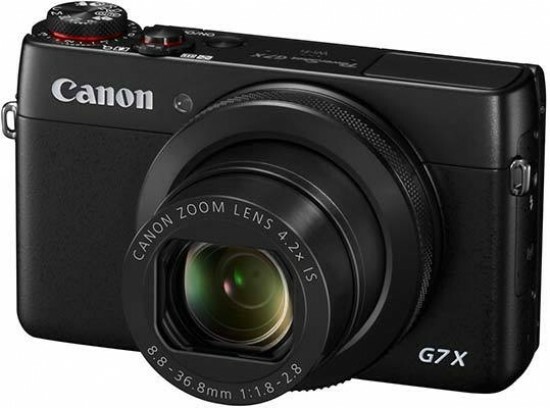 Canon have definitely caught up with the competition with the launch of the PowerShot G7 X. It offers the best balance between portability and functionality of any PowerShot camera to date, and is a serious rival to the Sony Cyber-shot RX100 Mk III. Highly Recommended!